Blog :: Jorge E. from Derwood, Maryland Named Star of the Month for February :: Read Naturally, Inc.
Our February Read Naturally Star of the Month is Jorge E. from Derwood, MD. Jorge is a sixth-grade ESOL student at Redland Middle School. His teacher, Deborah Romano, nominated him for his newfound self confidence and improved reading skills. Below is what Ms. Romano had to say about Jorge's success with Read Naturally. 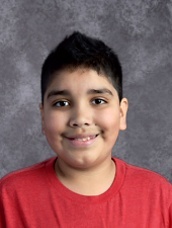 Jorge Espinoza is an 11-year-old 6th grader who attends Redland Middle School in Derwood, Maryland. He is an ESOL Student as well as a student who has an IEP. He is currently in my Phonics for Reading class. This is a Reading Intervention Program that is designed to teach decoding skills that are generally introduced in grades one through three. I also teach the Read Naturally Live Program on Tuesdays and Thursdays with this class. When Jorge first came to me, he also came with some behavioral problems. He didn't have the interest in reading, nor did he have the confidence to read aloud. When he first started the program in September 2016, he tested in at a 1.5 reading level, reading 90 WCPM with his cold time. As of February 21, 2017, he is now at a 3.0 reading level, reading 92 WCPM with his cold time. He told his ESOL teacher that this class has made him "smarter." He now volunteers on a daily basis to read aloud, and has the confidence to read in other classes. I cannot wait to see how much he progresses by the end of the school year!